We know the ocean is at risk. Rising global temperatures, deoxygenation, and increasing acidity are all serious threats to marine ecosystems. Knowing these facts, it’s easy to fall victim to despair. But there is reason to hope – lots of it. 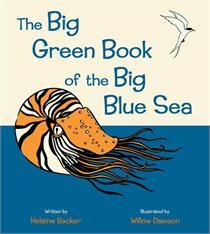 And that’s one of the inspirations for why I wrote The Big Green Book of the Big Blue Sea, my new book from Kids Can Press. It’s an experiment-based science book that teaches kids through first-hand exploration how different aspects of the marine system work – why ice floats, how currents form, how fish swim. It also gives kids a chance to explore environmental issues, like the enormous garbage island in the middle of the Pacific, or how an oil boom works. But The Big Green Book of the Big Blue Sea is more than an experiment book. It’s also a primer on the threats facing the ocean. And most importantly, it’s a serious discussion of what people today, all over the world, are doing to protect the sea and minimize the impacts of human activity. We all know that the media focuses on negative stories. They are immediate adrenalin-boosters, and feed into the human need to constantly scan the horizon for danger. But that focus on risk means we don’t really hear the other half of the story – we don't hear about the car that didn’t crash or the lost wallet that was retrieved. This is true when discussing environmental issues too. 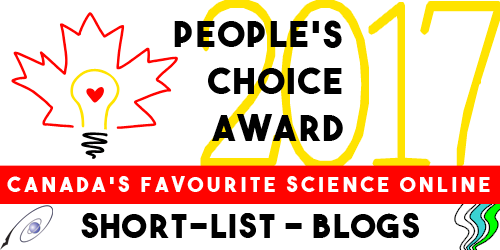 We hear about the coral dying, the sharks being finned, and the Dead Zones expanding. But few ordinary people realize that Dead Zones have also disappeared. That corals can be regrown. And that new laws across North America are in place that will help protect our seas well into the future. The Big Green Book of the Big Blue Sea presents it all: the facts, the risks, and the heartening stories of recovery. Some of the facts may surprise you –like learning pearls are NOT caused by bits of grit that get caught in the oyster’s shell!). Some may delight you – like discovering how the beluga whales of the St. Lawrence River are no longer in danger of extinction, thanks to a concerted effort by Quebec’s citizens and business community. Some may even astound you. But in the end, you (and your students) will discover the ocean is larger, more complex, and more diverse than anything you could have ever imagined. The truth is the ocean is under serious threat. We can’t be Pollyannas, pretending there are no problems. But we also can’t be Eeyores, seeing nothing but doom in our future. The reality is more nuanced. There are many reasons for optimism. Optimism, I think, is a requirement for children’s non-fiction. To tell young people, “all is lost” is counter-productive. It negates them, and their future. It also, plainly, is false; it's unsubstantiated opinion. The facts point in the other direction. Where there is life, there is hope. And there’s lots of life in the ocean: More, in fact, than anywhere else on the planet. Resilient, adaptaive, wildly creative life. Shouldn’t that fact alone give us reason to hope? Usually, the main ingredients in a casserole are cut the same approximate size. Not so in this dish – each of the round ingredients in this rich, continental-style stew represents one of the planets, and the planets differ tremendously in size. Just how different will become obvious when you sit down with space on your plate. Begin by preparing the largest of the planets, Jupiter. Peel the potatoes and shape them into round balls. Peel the onions of Saturn, the next largest planet. Lay the potatoes and onions on a baking tray, brush with oil to coat, and roast in a 450 ° F oven, turning occasionally, until they are golden brown. This will take 45 minutes to an hour. While Jupiter and Saturn are coming into being, mix together the hamburger meat, breadcrumbs and egg in a large bowl. Form the mixture into proto-Uranus balls slightly larger than 1 inch in diameter. This will allow for shrinking in cooking; cooked, the 1-inch meatballs will be the perfect Uranus proportions. Brown the meatballs in a nonstick pan and set them aside until the rest of the solar system is complete. In another bowl, mix together the dumpling ingredients – flour, egg yolks, milk, and salt and pepper to form a stiff, Neptune dough. Add more milk if necessary. Form 1 inch diameter balls, and set them aside too, covered with a tea towel, ready to put into the solar system sauce. To make the sauce, melt the butter over medium heat in a large, thick bottomed saucepan or high-sided frying pan. Add the flour and stir, letting it cook for a minute or two. Gradually add the bouillon a little at a time, stirring constantly. Add the tomato paste, peppercorns, Mars, and mustard seeds of Mercury. When the full two cups of bouillon are added, and the sauce is simmering, gently drop Neptune dumplings in, one-by-one, with a spoon. When the dumplings float to the top, they are done. Add the green peas, the larger ones representing green Earth and the smaller ones, cloudy Venus. Add Jupiter potatoes, Saturn onions, and Uranus meatballs, and gently stir in the sour cream. Serve the stew with two potatoes and an onion per person. To finish, sprinkle each plate with paprika – each tiny speck is the relative size of Pluto – clearly a solar system garnish rather than a main ingredient. Space is vast. This is something we understand when we gaze at the layer upon layer of stars in the night sky. Just how tiny we are compared to the rest of the universe can be brought home – literally – by using a scaled model, such as this stew. In this case, the ingredients representing the planets are scaled down by a factor of 46 397, with the largest planet Jupiter represented by a potato. According to this scale, the Sun is the width of a typical family dinner table. We can think of these celestial bodies as fitting into four different categories. First, there’s the Sun – a star like countless others; a big ball of fire which comprises 99.86% of all the mass in the entire solar system. Then there are several smallish, dense planets. These are Mercury, Venus, Earth, and Mars - five times more dense than the outer planets. The big gaseous entities we call Jupiter, Saturn, Uranus, and Neptune come next. Pluto and its fellow dwarf planets is small in comparison, and icy, perhaps not even particularly round. The Sun is so far away it appears as a pinpoint, like all the other stars. There are nine different objects floating in this stew, and there used to be nine planets in our solar system. The discovery in 2003 of another object circling our Sun which is bigger than Pluto threw into question the definition of the word planet. Traditionally, a planet is a large object that orbits a star. The problem with this definition is that there are many large objects orbiting our Sun in the space beyond Pluto – by some estimates, tens of thousands more. Some think the title of planet ought to be limited to only very large objects, say bigger than 3000 km in diameter. That would discount Pluto, but it would mean that our own Moon should be classified as a planet too. Others argue that tradition should rule in cases such as this – and we should stick with nine planets for cultural reasons, and not make Holst’s symphony obsolete. Whether Pluto is a main ingredient or a garnish makes little difference to our planetary stew. It is delicious regardless. A planet stew gives us no idea of the distances between them. You could try going for an walk with your bowl, and eat your way through the solar system. With your dining table as the Sun, a Mercury peppercorn should be consumed 32 metres away, followed by a Venus mustard seed at 59 metres, peas for Earth and Mars at 82 and 125 metres, and a Jupiter potato at 426 metres. If you live in the city you will likely be a block away from your house by now. Saturn’s onion is at 780 metres, a Uranus dumpling at 1, 571 metres, and a Neptune meatball at 2 464 metres - about an hour and a half’s walk. To place Pluto’s paprika fleck you might as well get in the car and drive to the 3 237 metre mark or you’ll be up very late. On second thought, it might be a lot easier to stay home for dinner tonight, and have space on your plate instead. 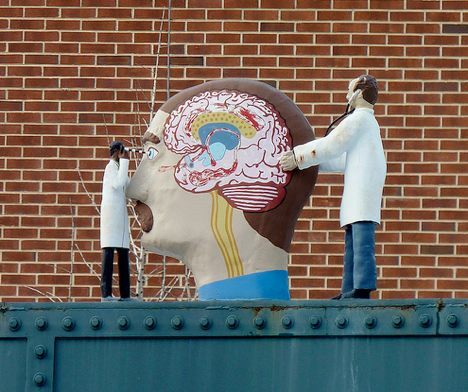 Learning about the brain might seem like something that's only interesting for neuro-scientists (photo by Dendroica cerulea via Flickr Creative Commons). But the more we find out about the brain, the better off we are - or that's what Dr. Bruce Perry seems to say. I was lucky enough to attend one of his workshops recently, and he made it easy to understand how the brain works, and how we learn. The workshop was geared to child trauma, but I think some understanding of the way the brain works can help in many other contexts. Perry's diagram of an inverted triangle divided into four parts is easy to understand: the bottom of the cone is the brainstem, and the top is the neocortex. I'm simplifying it of course, but essentially, Perry reminded us that it's important not to ignore the lower areas of the brain (brainstem, diencephalon, and limbic), while we try to communicate through the higher levels (neocortex). For example, any time we learn something new, we go through stress, he says. Our ability to self-regulate, or pay attention, is affected by the lower areas of the brain. Demanding attention - through the neocortex - won't be as effective as planning to engage it from the bottom up. Perry's theories make sense. We expect young children to move from one activity to another within any given hour. We build rhymes and rhythm and movement into great preschool programming like Mainly Mother Goose and Toddler Time to help them learn. Why do we forget the importance of these regulatory breaks as children grow older? Or even as we grow older? There was a lot more to this workshop, of course. Some of this material can be found on the Child Trauma website Perry founded, at www.ChildTrauma.org. Scholastic also provides a section about him that will prove useful to teachers: http://teacher.scholastic.com/professional/bruceperry/. 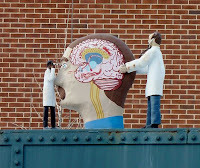 Learning more about the brain can help us understand how best to approach and positively influence others, and I believe it's especially important for those of us who work with and write for children. It's useful to think about how we learn, and visual images like the ones Perry uses can help make it easier to understand. 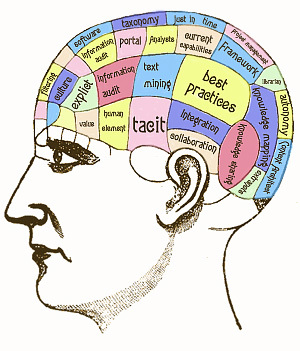 Here's another image of brain mapping called "Knowledge Management," provided courtesy of Harold Jarche. How do scientists learn about animal behavior? Sometimes animals are outfitted with collars that allow scientists to track the animals in order to learn about their daily life, the food they eat, hunting, nest building and much more. In this wonderful video, Rick Mercer accompanies park wardens as they tag new born bear cubs in the wilderness of northern Ontario.